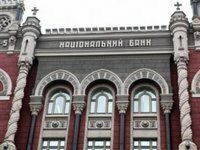 The National Bank of Ukraine (NBU) has suggested implementing the National Security and Defense Council (NSDC) decision by banning the Ukrainian subsidiaries of Russian state-owned banks from moving capital outside Ukraine. "The imposition of such sanctions means prohibiting the carrying out of any financial operations in favor of the parent bank, i.e. granting interbank loans, deposits, subordinated debts, purchase of securities, placement of funds at correspondent accounts and other such operations," NBU First Deputy Head Yakiv Smoliy said at a briefing. "This also involves banning payment of dividends, interest, return of interbank loans, funds from correspondent accounts and a subordinated debt. We also propose banning profit and capital distribution," Smoliy said. The sanctions are being proposed not because of Russia's decision to recognize the so called passports of Donetsk and Luhansk people's republics but for the sake of financial stability and to ensure that Ukrainian banks with Russian state capital fully honor their obligations to clients, NBU Deputy Governor Yekateryna Rozhkova said.